Pet Rest Gardens offers only certified cremation services and maintains a permanent record of all cremations preformed. Each pet is assigned a record number, which becomes a part of our permanent file. 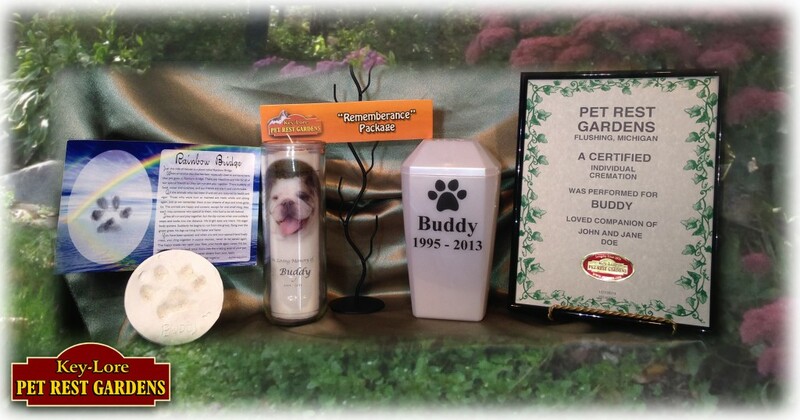 We assure you that your pet is handled with care and respect at all times and guarantee your pets cremains will be returned promptly and professionally in the urn of your chosen package. We want you to have confidence in our service, and as members of the International Association of Pet Cemeteries and Crematories, we are required to maintain the highest business and ethical standards. We now offer Pre-planning Options. This is the question most frequently asked of our staff. The cost of cremation depends entirely on your families wishes. Total price reflects the type of pet as well as memorialization choices and final disposition of cremains. Simple alternatives are available, as are choices that are more traditional. It is important to consider all options, preferably with one of our planning professionals who can explain the benefits of each. Your pet will have company during the cremation, but will be identified and placed individually in their own location within the crematorium. This standard cremation service provides for your pets dignity and privacy. Upon completion the cremains are kept separate and you may be assured that you are returned all and only your pets cremains. 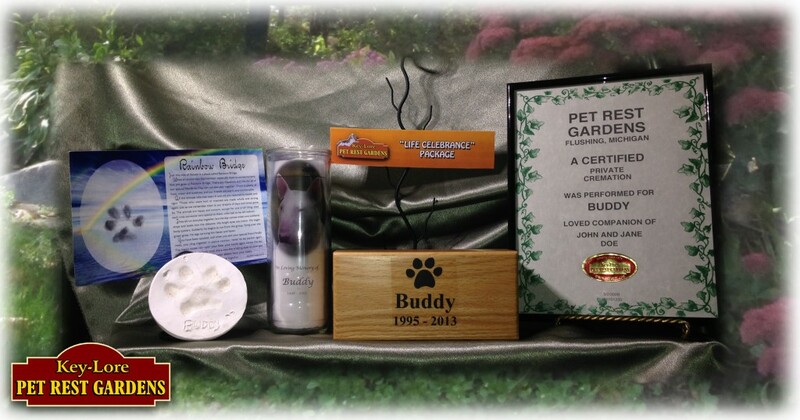 Our above fees include Rainbow Bridge Paw Print Card, Certificate of Individual Cremation, Complementary PawPrint Urn For other unique selections, please see our PET URNS, CASKETS & MEMORIALS section. *Prices shown are just cremation prices, there is an additional charge for the office arrangement. Transportation prices are quoted separately and based upon distance of the pickup. Just like the My Special Friend Cremation this is another option. Your pet will have company during the cremation, but will be identified and placed individually in their own location within the crematorium. This standard cremation service provides for your pets dignity and privacy. Upon completion the cremains are kept separate and you may be assured that you are returned all and only your pets cremains. *Prices shown are just cremation prices, there is an additional charge for the office arrangement. Transportation prices are quoted separately and based upon distance of the pickup. An absolutely private, single pet cremation service. Your pet will be the only pet placed in the crematorium and the cremains will be returned to you within 48 hours in our Distinctive Oak Urn. ATTENDED PRIVATE CREMATIONS available for those families wishing to witness and partake in the cremation process. 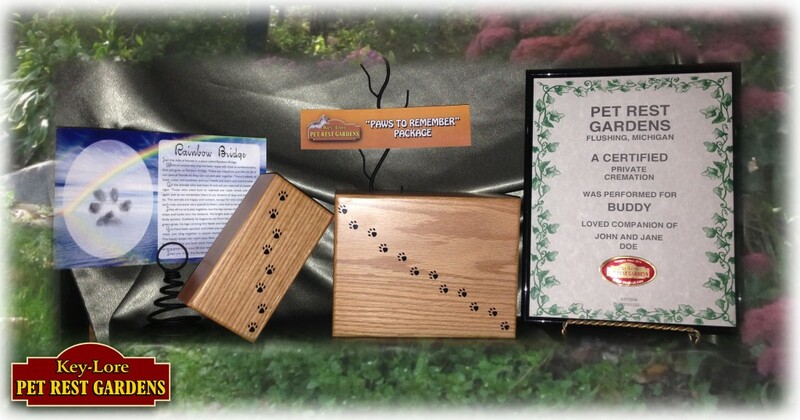 Our above fees include Distinctive Oak Urn, Rainbow Bridge Paw Print Card, Certificate of Private Cremation. 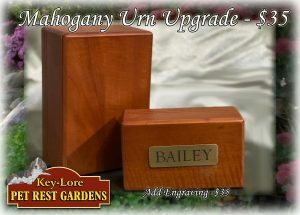 *Prices shown are just cremation prices, there is an additional charge for the office arrangement. Transportation prices are quoted separately and based upon distance of the pickup. Just like the Paws to Remember Cremation this is another option. An absolutely private, single pet cremation service. Your pet will be the only pet placed in the crematorium and the cremains will be returned to you in our “Paws to Remember” Urn. ATTENDED PRIVATE CREMATIONS available for those families wishing to witness and partake in the cremation process. Our above fees include Customized Oak Urn, Customized Candle, Customized Baked Paw Print, Rainbow Bridge Paw Print Card, Certificate of Private Cremation. *Prices shown are just cremation prices, there is an additional charge for the office arrangement. Transportation prices are quoted separately and based upon distance of the pickup. Quite possibly the most bittersweet part of losing a beloved pet is receiving back the cremated remains. But for many, holding their beloved’s remains again, feeling their presence in the living room once more in a beautiful PET URN, or putting those ashes in the flower garden in which the pet loved to sleep, provides a comforting sense of the pet coming back home. Deciding on the proper, permanent resting place for your companion can be a difficult decision, and you want it to be just right to memorialize everything that pet meant to your family. Memorialization should make you smile and remember that a great friend shared your life. Cremation is a process whereby a pets remains are consumed by heat and reduced to ash and small bone fragments. It is an ancient purification ritual which has been in existence for centuries. The cremated remains are placed in the container provided by the crematorium or placed in a PET URN purchased by the family. WHAT IS AN ATTENDED PRIVATE CREMATION? For many pet owners, participating in and witnessing the cremation may be a necessary final step in finding closure for their loss. At Pet Rest, we allow the owner to take part in the actual cremation process. This may be as simple as having family accompany the pet to the crematory building or you may wish to fully assist our certified crematory operator in the entire cremation process. Professional care and grooming may be done at your request prior to family viewing. Music, photos and group remembrance are some of the ways families may say farewell. Special items from home, such as toys and favorite blanket/bed may also be cremated with your pet if desired. Family and friends may spend final moments with their companion and stay until the cremation is completed or return at a later date and time to receive the cremains. If a CUSTOM ENGRAVED URN will be the final resting place for the cremains, it may take a few days to create. Attended cremations are scheduled at your convenience. For health and safety reasons, we recommended an attended be the first cremation of the day so the crematory well be at its coolest point. Please call 810-659-6114 to schedule this service for your companion. WHY DOES THE COST FOR CREMATION VARY? If you have chosen a PRIVATE CREMATION for your pet, they will have a dedicated crematory for approximately 2-5 hours. Since most crematories are fired by natural gas, I am sure that you understand the relationship between time and expense. If you have chosen an INDIVIDUAL CREMATION for your companion, you are actually paying for a proportionate use of the crematory space. Hence, the difference in cost between a small pet and one that is quite large. WHAT ARE ARRANGEMENTS? WHAT TYPE OF ARRANGEMENTS WILL I BE MAKING? Arrangements are basic services including – Initial response to request for service, filing of necessary authorizations & consent forms, identification & tracking numbers recorded. These are consultation and arrangements performed for you and your family relating to the cremation or burial of your companion. We will discuss options, urn choices and answer any questions your family may have. One of the most important aspects of saying goodbye to your beloved pet involve making sure that your pet and belongings are properly identified. Our arrangement & consultation assures that your wishes will be carried through as specified. Items to be saved & returned to you are tagged. While those which will be cremated or buried with them are done as decided upon by you and your family. Correct spelling of both pet and family name are double-checked. You will also be allowed sufficient time to say your last goodbyes. Also included in the charges are overhead expenses relative to our facility; such as insurances, utility expense, secretarial and administration costs. Our arrangement fee will be added to the total cost of services you select. The entire cremation process will take between 2-6 hours depending on the choice of cremation and the size of the pet being cremated. CAN MY PETS THINGS BE CREMATED WITH THEM? Yes, your pet has a lifetime of possessions that are very special. While you will never throw them away, it may be painful to just have them scattered around your home. Cremains are actually heat calcified bone fragments. They are a whitish/grey in color and sometimes may have green or turquoise particulates in them. The color is a result of minerals contained within the bone itself. Most people are surprised to find that they are not just fine dust. The bone fragments are very small and are not offensive to view. The total amount of cremains, referred to in cubic inches, is directly related to the type, size and weight of the pet that is cremated. HOW CAN I KNOW THAT I AM GETTING MY PETS CREMAINS BACK? This is a question that concerns us all. The answer is really a matter of professionalism, ethics, integrity, and most of all, trust. At Pet Rest Gardens, we have an “Open Door Policy” which welcomes tours of our facility, including the crematory. All cremations performed at our facility in Flushing. your cherished pet is never out of our care. In this way, we have total control over the entire cremation process from the time we receive your companion to placing cremains into the correctly chosen and sized urn. You may ask to speak to one of our certified crematory operators and ask how the cremation of your pet will be handled and when it will take place. Every cremation is issued an identification tag and record number which becomes part of our permanent file. We are very proud of our services and are pleased to answer any and all questions you may have. Thank you for entrusting your pet to our care. WHEN WILL MY PET’S CREMAINS (ASHES) BE READY TO BE PICKED UP? Because we recognize the need for closure and grief recovery, your cremains will be available for pick up at our offices within 48-72 hours. Cremains may also be returned to your veterinary clinic in a timely manner. 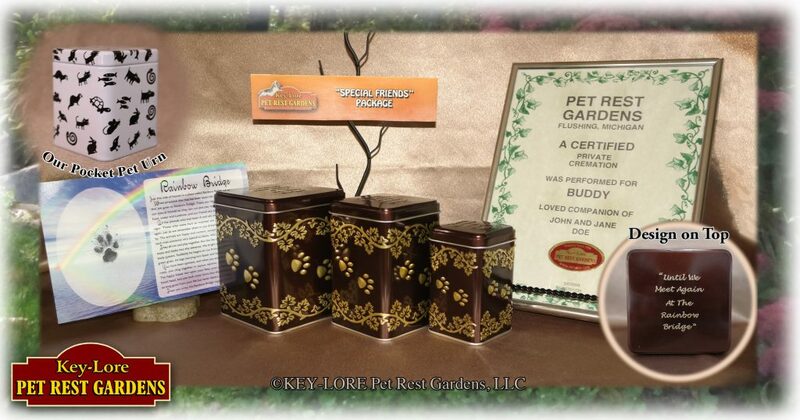 MAY I BRING MY COMPANION TO PET REST GARDENS FOR CREMATION OR BURIAL? Yes, you may. Our comfortably appointed offices and product display area is available by appointment. Families with children as well as your other “four legged kids” are welcome to accompany your companion on their last journey. We have a library of pet loss books to help children and adults through this difficult time. Please call 810-659-6114 to make arrangements. CAN YOU PROVIDE TRANSPORTATION FROM MY VETERINARY CLINIC? Yes. Many veterinarians work directly with Pet Rest Gardens of Flushing, Michigan, and arrangements may be made through those clinics or by calling us direct at 810-659-6114. While we never want to imagine the possibility that our loved ones will not be with us forever, sometimes illness or other situations arise that cause a concern regarding the loss of your pet. Pre-planning allows you the ability to research, ask questions, and decide what is truly right for your family companion. We will ask your pet’s name and some details about why you are calling. An inquiry card is started for you so that if you choose to use Pet Rest Gardens for your companion, future calls are much easier for both of us. This takes place prior to the actual “day” and while you are ,hopefully, calm and relatively unemotional. Many people pick up the phone, begin to dial our number, only to hang up before we answer. That’s OK. All things take time, and acceptance is but the first of the STAGES OF GRIEF. We want you to know that we are there for you, to develop a trusting relationship, and to answer your questions with honesty, even if you never use our services. MY PET DIED AT HOME – WHAT DO I DO? First of all, don’t panic. You may think that immediately following death their body will begin natural processes but that is not the case. If you are emotionally comfortable, your pet can remain with you in your home for hours without any ill effects. Call Pet Rest Gardens at 810-659-6114 for an appointment or to provide transportation for your needs. To be able to anticipate your needs and prevent interruption of final goodbyes and private time, we ask that you call ahead to schedule an appointment. We will make every effort to accommodate your schedule as well as handle emergencies which may arise. Thank you for your understanding. IS PET REST GARDENS AVAILABLE EVENINGS, WEEKENDS OR HOLIDAYS? Yes we are. We closely monitor all incoming calls and will return voice mail messages promptly. A counselor will arrange to meet you at our office at an appointed time. Our mobile on-call service personnel is available for home or veterinary hospital transportation. I WISH A DIGNIFIED SERVICE FOR MY PET COMPANION BUT DO NOT WANT CREMAINS BACK. WHAT CAN YOU OFFER? Following a private or individual cremation, your pets cremains may be scattered by family members or you may choose to have our staff perform the ritual for you. In either case, the scatter garden fulfills the need for a peaceful, final resting place to come and remember those special times. There is no charge for scattering of cremains in our garden. This is the perfect choice for you. 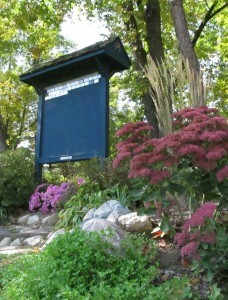 This beautiful, fragrant garden was dedicated in 1987 and is limited to cremains burial only. Hybrid and Floribunda Roses of many colors provide tribute to the champions and companions who have shared our lives. 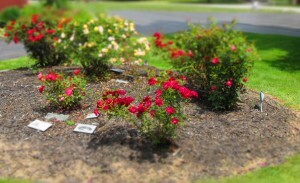 You may also wish to consider a Cremains Burial in our ROSE GARDEN CREMAINS BURIAL area. This area offers a beautiful, fragrant traditional approach to memorialization and provides for graveside visitation as well as a personalized REMEMBRANCE MEMORIAL. One of our professional, planning counselors will be able to assist you.